I'm taking off in an hour and a half, flying to Turkey to spend a week and a half at my dad's, where I plan to write my head off and drink my weight in pomegranate juice. Then, it's a week in Thessaloniki, where I will be meeting up with Tony and Mama Greek to show the film at the film festival there. Bliss, right? (Well, except for the Mama Greek part, but thankfully she's heading off to Athens after two days to spend time with all the other Mama Greeks.) Probably bliss, to someone else, someone I feel like I should be right now, someone with impeccable hair and matching luggage, one component of which houses her dog, whom she already misses even though she waved goodbye to him half an hour ago at the security gate. But instead I'm sitting here eating gluten-free cookies from a Ziploc bag in my purse and trying to scrub the paw marks off my pants. And though I feel I should feel light and floaty and adventurous, I am exhausted, and annoyed, and specifically annoyed at my husband, with whom I argued not once but twice in the last 24 hours. It's Monday, and I feel like the last person on earth who should be dishing out wisdom or reassurance. 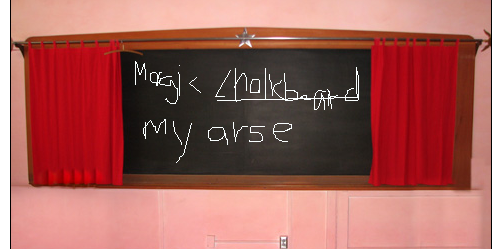 Plus, I don't have a chalkboard, and this virtual one I found online doesn't work very well. But since I'm not exactly teeming with Zen one-liners or encouragement, I'm going to steal from TUT. Do you know TUT? It's this great little thing that sends you messages "from the universe" every day, by e-mail. I don't even know why I put "from the universe" in quotes, because from the little I understand of e-mail, it may as well come from the universe, and anyway, don't we sort of all come from the universe, e-mail, toenails and all? It may seem a bit backwards for some, Natalie, but the first step one might take towards rearranging the present circumstances of their life is to stop dwelling upon the present circumstances of their life. 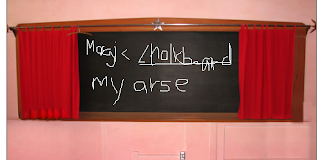 :) That's what I did when I read this post. Hope you're having a great time! Thanks Chris! :) right back!